Open the ASPX page in Microsoft SharePoint Designer 2010. 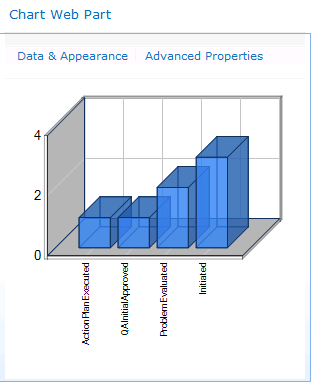 Locate the Chart Web Part in Code View. Edit the ShowToolbar property from “True” to “False”. No problem, glad to help. Nick. Does it’s possible to change the template in order to avoid having to change each page .aspx of sharepoint? Icarus, Once you’ve set up your chart, you can use SharePoint Designer to save (export) the web part. This exported web part can then be added to the web part gallery and so will be available when adding web parts to other aspx pages. You’ll then be flying 🙂 Nick. If not abuse, you might ask how? Terrific advice, just what I was looking for. I am using this part in SP2013 as well. It is a bit janky but nonetheless the price is right. 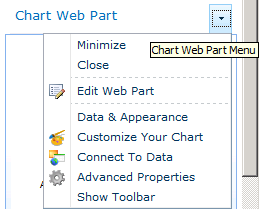 Nick, what do you suggest for charting in SP 2013 now that it doesn’t have the Chart Web Part? I was looking at http://www.collabion.com, which looks like it has some advanced features, but I was wondering if you have any recommendations.